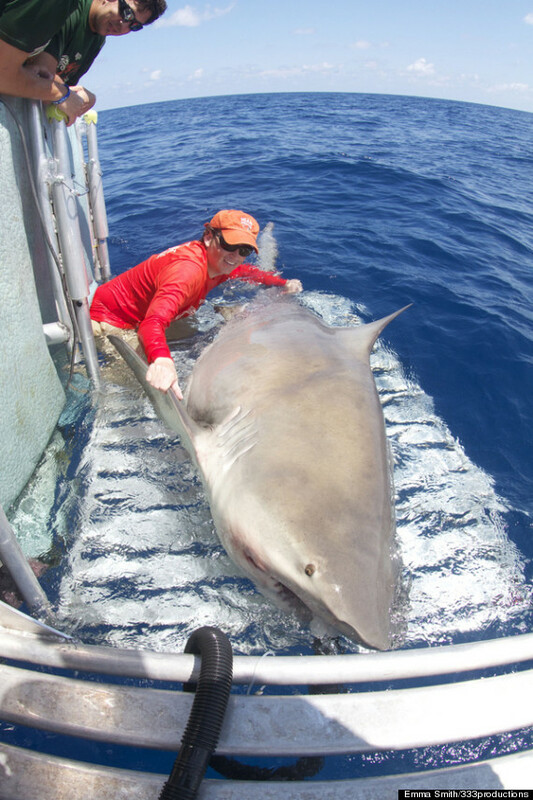 This 1000 pound bull shark (Carcharhinus leucas) was caught by scientific researcher Neil Hammerschlag and his team in Southern Florida on the 27th of May 2012. Researchers took blood samples and ID tagged the individual before releasing. I have been a huge fan of the work performed by this lab and the science produced from this team is really world class. In 2011, I was lucky enough to be involved in the capture and release of a bull shark on a scientific long line out in Bimini (Story and photos will be posted at a later date). The specimen we tagged looks minute in comparison to this giant. Its really promising to see such large individuals existing in the wild that have evaded commercial capture and imperilment. Lets hope we see an increase in larger scientifically reported sharks as their protection improves. I’ve seen a lot of bull sharks and that thing is huge!!! I would have loved to have been there, but then I’m glad I wasn’t. I’ve seen a lot of bull sharks and that one is HUGE!!! I wish I would’ve been there, but on the boat.